Do the Children in Your Classroom Have Bodies? “I think, therefore I am.” When French philosopher René Descartes offered that premise to the world, the notion of mind/body dualism began. As I’m always telling my audiences, I have no idea why anyone would believe that the mind and body are separate entities, let alone why the idea has lasted as long as it has! Granted, I can cut old Descartes a little bit of slack. They didn’t have the research during his time that we have today. But anyone who has ever taken a walk that sparked an insight or an idea should be able to make the connection – as should anyone who finds himself thinking more clearly while pacing than while sitting or immediately following a run. So, why are we still behaving as if children consist of heads only? Or is it just that we wish they did? It would be easier, after all, if we only had to worry about their brains. 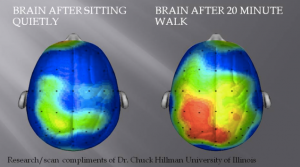 If sitting really did equal learning. In his book, Teaching Children Physical Education, George Graham describes his experiences going before school boards and administrators to convince them to add or return PE to the curriculum. He tells them it would be great – and, in fact, very cost-efficient – if we could just bus the children’s heads to school. But, gee, those heads don’t come unaccompanied. Also in Graham’s book is a cartoon depicting headless children entering the gym. The moral? Children must not move in the classroom or think in the gym – because, after all, the brain and body supposedly have nothing to do with one another. Numerous studies have demonstrated that physically active students perform better in, and have better attitudes toward, school. Movement is the young child’s preferred – and most effective – mode of learning. I often wonder why we insist on teaching children in any way other than via their preferred – and most effective – method. I can’t help thinking about all of the lost potential through the years as children have been forced to learn in ways that aren’t developmentally appropriate for them – and that even make them miserable. On the flip side, I envision schools that recognize the mind/body connection. Where teachers add brain breaks to the day by occasionally inviting students to stand and jog in place or to do the Cross Crawl, alternating opposite elbow to knee. Where they allow them to take a quick jaunt around the room or play a quick game of Simon Says (without the elimination process), knowing that these kinds of activities change the chemistry of the brain, boosting norepinephrine and dopamine, the latter of which increases working memory. Where students are allowed to stretch or stand as needed. Where active learning is the norm. Imagine the enjoyment – for both students and teachers – of a classroom in which few struggle, and everyone looks forward to being there. Imagine a lower dropout rate. Imagine more students completing school with a belief in their ability to succeed. Sadly, he wrote that in 1929. And, 88 years later, I’m still duty-bound to make the same case. NOTE: This post was sponsored by myMAX, revolutionizing Family Child Care one provider at a time. If you have ever been too busy to log a snack or diaper change, you’ll be glad to know that with myMAX you can multi-task simply by using your voice to record daily activity logs, meals and milestones…and that’s just the beginning. For a special holiday offer, click here. True ! It is the most important activity of the learner in the clssroom to feel free to move,to speak and to ask which is generally stopped by the teachers for the sake of so called discipline.But it supresses the active learning procedure of the learner and creates hindrances in learning.Most of the children become supressed and lose confidence. Thank you for weighing in, Naushaba! You’re so right when you say all of this is in the name of so-called discipline. We have to begin prioritizing the children’s needs over our need for control.